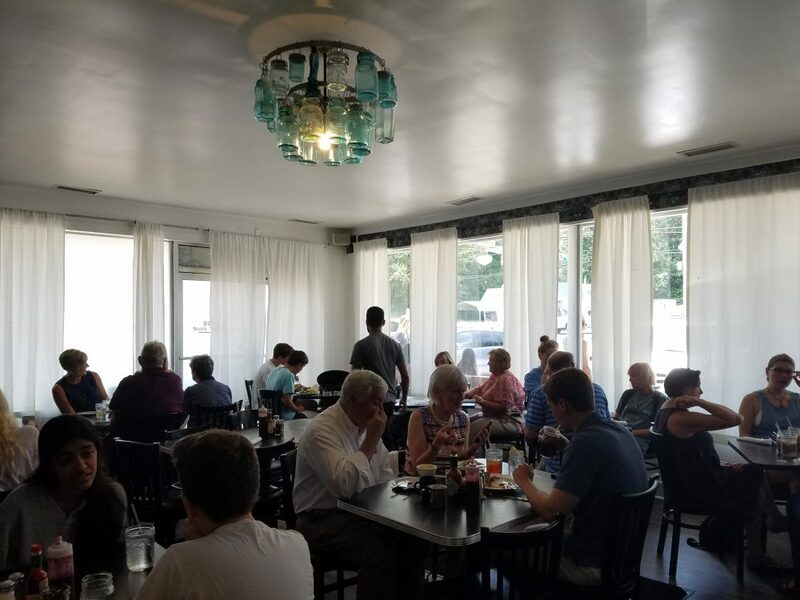 Mama’s Boy in Athens Takes Care of All Your Southern Breakfast Needs – Why Am I Not There? One of the things I’ve realized on trip is how much I’m missing out on Southern cuisine in terms of barbecue, biscuits and all things fried. We all think that our Northeast versions of these things are “the best” around. It ain’t. That’s evident with my first stop in Georgia. After a 50-mile drive on a one-lane highway through Georgia backwoods and farmland, I ended up at Mama’s Boy. The 12-year old restaurant serves southern goodness in biscuit, breakfast and fried form. Then smother all that in gravy and you’ll need a nap afterwards. Since I have a full-day of activities ahead, I went gravyless, but asked for a little taster cup like you would ask for a taster at a craft brewery. It was so good, thick and savoy I was taking my finger and digging around the cup for every last part. I also had a fresh-fried donuts in Asheville beforehand, so I didn’t want to kill my waistline in one day. I went with the fried chicken breast on a biscuit, sweet tea and a side salad, like that salad would make a difference. Wait, there’s more! Jalapeno raspberry jam to spread on parts of the biscuit not covered by fried chicken. All this was served by a fine southern gentleman in a trucker hat. He could have been a roadie for the B-52 for all I know. Since this is a popular local spot with a positive reputation in the region, there’s a wait unless you do what I did … sat at the counter. It takes up to 4 people, and you skip waiting outside in the hot Georgia sun. I was even lucky in the small parking lot and got a space right in front of the door. It’s one of those situations that you think it’s a handicap spot, but in reality, it’s the best spot. If there is overflow, there’s some open lots behind the joint. You can even take the food to go, but why would you? You can soak up some southern hospitality in the dining room. I did take home their coffee and stickers. For this trip, I’m all about the free stickers.